Chronic respiratory diseases are among the four major human chronic diseases. Tobacco smoke as well as environmental pollutants, infections, physical activity and nutritional status play a role in the prevalence, development and/or progression of chronic obstructive pulmonary disease (COPD). Changes in lifestyle are possible and may be beneficial in prevention and comprehensive management of COPD. Population-level interventions aimed at early diagnosis, promotion of vaccinations and prevention of infections, and reductions in smoking, environmental pollutants, physical inactivity, obesity and malnutrition may increase the number of life-years lived in good health. To improve awareness of the influence of lifestyle on natural history of COPD. To describe the effects of some interventions to modify lifestyle in prevention and management. To provide information on the main clinical results. To define recommendations and limitations. The World Health Organization (WHO) includes chronic respiratory diseases (CRD) among the four major human chronic diseases and lung disease accounts for an estimated 7.5 million deaths per year, ∼14% of annual deaths worldwide . These diseases are a major economic burden and source of gender and social inequalities within and between countries. The most frequent diseases include, in descending frequency, chronic obstructive pulmonary disease (COPD), lung cancer, tuberculosis, lung infections, asthma and interstitial lung diseases . These complex diseases often begin in early childhood, and affect patients throughout their life, worsening progressively with ageing mainly through increasingly frequent and severe exacerbations [2–4]. The European Union indicates prevention, early diagnosis and treatment of these diseases as a priority for public health policy . Lifestyle influences health status starting from adolescence. There is evidence that even in childhood negative impacts on health can be observed. This is more evident when health is defined according to the “positive health” definition proposed by Huber et al. , for example obese children score significantly lower on daily functioning and quality of life than non-obese children. Data show that individual behaviour-related, family behaviour-related and “environmental” risk factors result in shorter healthy life expectancy and shorter chronic disease-free life expectancy . Tobacco smoke, as well as environmental pollutants, irritants and allergens, plays a role in the prevalence, development and progression of many CRD. Smoking habit adds to other behavioural risk factors. For example, in the USA >50% of adults have at least two behavioural risk factors with a synergistic negative influence on chronic diseases . Changes in lifestyle are possible and may benefit the comprehensive management of these diseases: from 2000 to 2010, Danish people with and without COPD, increased their leisure time physical activity and reduced smoking . Systematically designed population-level interventions aimed at early diagnosis, vaccination promotion, and reducing smoking, physical inactivity, obesity and malnutrition may increase life-years lived in good health . Interventions need to be mapped conscientiously in order to have effects, for example based on the well-known intervention mapping protocol . The first step for any effective management of disease is an appropriate and early diagnosis. Although comprehensive physiological assessment is important, the cornerstone of diagnosis and monitoring of COPD is the assessment of lung function. Unfortunately many pulmonologists do not always recognise the value of their main diagnostic tool in the same way as cardiologists recognise ECG or echocardiography. Despite many barriers to widespread routine lung function tests around the world, mass screening campaigns may discover new cases of COPD. Furthermore, an early diagnosis may influence the patient's motivation to quit smoking . The injectable trivalent, inactivated influenza vaccine is composed of seasonal H3N2, H1N1 and influenza B and is available each year as an annual dose . The trivalent influenza vaccine is effective in preventing hospitalisations and other serious outcomes . Therefore, public health authorities and the media should highlight the overall benefit of influenza vaccines over time despite their year-to-year variability, especially in an age of “internet-based medicine” resulting in low confidence in evidence-based medicine and a reduction in vaccine coverage. A few studies have shown that inactivated vaccines reduce influenza-associated exacerbations occurring three or more weeks after vaccination in COPD patients . Limited evidence from randomised controlled trials suggests that injectable polyvalent pneumococcal vaccines may provide some protection against morbidity in persons with COPD . The adult pneumococcal vaccine is a 23-valent polysaccharide vaccine (PPSV23) including the most common serotypes associated with disease in adults . However, the clinical efficacy of PPSV23 tends to reduce with age and wane over time: it may be not effective in patients >65 years of age . The 13-valent protein conjugated pneumococcal vaccine (PCV13) has superior immunogenicity and increases the duration and memory of immune responses. However, it does not cover all serotypes associated with invasive disease . Evidence-based guidelines recommend pneumococcal vaccination in patients with CRD and PCV13 has been included in most national recommendations. The US Advisory Commitee on Immunisation Practices currently recommends PVC13 followed by PPVS23 for all adults >65 years of age and not previously vaccinated, and in persons >19 years of age at high risk of pneumococcal disease . One of the major objectives of the management of COPD is the prevention and effective treatment of exacerbations. Patients with COPD with sputum production, purulence and increasing dyspnoea may benefit from appropriate antibiotic therapy. Some studies have evaluated the continuous or intermittent use of antibiotics even when patients are stable to prevent exacerbations. Several antibiotics have been developed to be nebulised for both treatment and prevention of acute exacerbations . There is no need for further evidence that smoking causes cancers, respiratory and cardiovascular diseases and is associated with an ∼10-year reduction in life expectancy . Total tobacco-attributable deaths, including those due to COPD, are projected to rise from 5.4 million in 2005 to 8.3 million in 2030 , due to the increasing number of smokers . Effects manifest after a long, silent lag-time preventing individuals from quitting smoking before symptoms start . Smoking cessation strategies require resources and time, but may influence the natural history of diseases achieving long-term success rates of up to 25% . Law-enforced smoking bans may lead to improved health outcomes through reductions in second-hand smoke, but are not enough. A Swiss study showed chronic damage from long-term second-hand smoke exposure and that respiratory symptoms such as cough decreased within 12 months after the national ban . There is also evidence of a positive impact of national smoking bans on cardiovascular health outcomes and mortality for associated smoking-related diseases, although the effects on perinatal health seem less consistent . Nicotine replacement therapy (NRT), bupropion, varenicline and cytisine improve quitting rates. Combinations of NRT and varenicline as well as nortriptyline are effective too. No treatment shows such adverse events as to prevent or reduce its use [28, 29]. Interventions combining pharmacotherapy and behavioural support increase smoking cessation success rate as compared with a minimal intervention or usual care . Electronic cigarettes (e-cigarettes) are devices that vaporise nicotine to support smokers in quitting or reduce their smoking habits. Low-quality studies show a positive relationship between e-cigarette use and smoking cessation . The potential benefits of e-cigarettes to the individual smoker should be compared with the potential harm to the population of increased social acceptability of smoking. It has been recommended that electronic devices should be restricted or banned until more information about their safety is available, and if allowed, that they should be closely regulated as medicines or tobacco products . Behavioural treatment is recommended for people attempting smoking cessation by identifying and modifying behaviours able to influence smoking habits. Individual, group or telephone counselling interventions are effective and their power increases with the intensity of treatment . To date, there is no evidence for preferring any form of behavioural or pharmacological treatment. Poor indoor air quality, especially from biomass fuels, is a well-recognised risk factor for COPD and other CRD, which is potentially modifiable by use of cleaner fuels, cooking stoves or heaters, and improved ventilation. According to the most recent WHO report ∼7 million people die every year due to exposure to fine particles, with polluted air accounting for 43% of deaths due to obstructive lung diseases and 29% of those due to lung cancer . Traffic-related air pollution is associated with an increased incidence of asthma in children . Household air pollution is a leading cause of disability-adjusted life years globally, resulting in systemic health effects that are evident from pre-conception to old age. There are many sources of household air pollution, which differ from country to country. Indoor tobacco smoking, construction materials used in building houses, fuels used for cooking, heating and lighting, and the use of pesticides and chemicals for cleaning are some of the many sources that contribute to household air pollution . Occupational exposure is also an important, global cause of acute as well as CRD. Unlike many other noncommunicable lung diseases, the causes of many occupational lung diseases are well understood and they should be controlled by means of established and effective approaches. For example, the risks from exposure to silica and asbestos are well known, as are the means of their prevention. The incidence of interstitial and malignant lung diseases remains unacceptably high due to lack of control measures or to new modalities of exposures. With the advent of innovative technologies, new threats are continually introduced to the workplace . The incidence of environmental and occupational lung disease has decreased in many western countries, whereas in rapidly developing countries with increasing population growth these exposures are still associated with high disease incidence. For example, the overall prevalence of COPD in the Chinese adult population is 8.6%. Smoking exposure of ≥20 pack-years, exposure to annual mean particulate matter with a diameter <2.5 μm of 50–74 μg⋅m−3 or ≥75 μg⋅m−3, a body mass index (BMI) <18.5 kg⋅m−2, childhood chronic cough, parental history of respiratory diseases, and low education are major risk factors . Physical inactivity has a major impact on world health. Sedentary behaviour is a risk factor for disease, (partly) independent of physical activity . It has been calculated that lifestyle modification leading to reduction and elimination of physical inactivity would avoid between 6% and 10% of the major noncommunicable diseases, such as coronary heart disease, type 2 diabetes, breast and colon cancers, and increase life expectancy . Higher levels of physical activity increase healthy and chronic disease-free years in men and women, but the effect is greater among persons with a low rather than a high occupational status . Physical activity is associated with a lower risk of mortality and cardiovascular events in individuals from low-, middle- and high-income countries . There is an association between levels of physical activity and all-cause and cardiovascular disease mortality risks, with protective effects at lower than the commonly recommended intensity levels for walking and sport/exercise, but not domestic physical activity . There are differences in practice of physical activity within countries, mainly due to inactivity of females and environmental factors, such as the walkability of cities . Therefore, public interventions aimed at increasing the walkability or cyclability of cities would result in improvements in public health. Daily physical activity of patients with COPD is reduced in the early phases of disease as compared with healthy age-matched controls and worsens over time, with important clinical consequences . Improving aerobic fitness during childhood and adolescence is associated with greater lung volumes in adulthood, but not airway calibre . Moderate-to-high levels of regular physical activity are associated with reduced lung function decline and exacerbations in patients with COPD, and a reduced risk of developing COPD among smokers [47, 48]. Family may also play a role: patients with COPD are more inactive and sedentary than their loved ones, despite relatively similar exercise motivation. Nevertheless, patients with an active loved one are more active themselves and have a higher likelihood of being active . In patients with COPD exercise training programmes improve symptoms, exercise capacity and health-related quality of life (HRQoL) [50, 51], although the observed benefits do not consistently translate into enhanced physical activity levels . 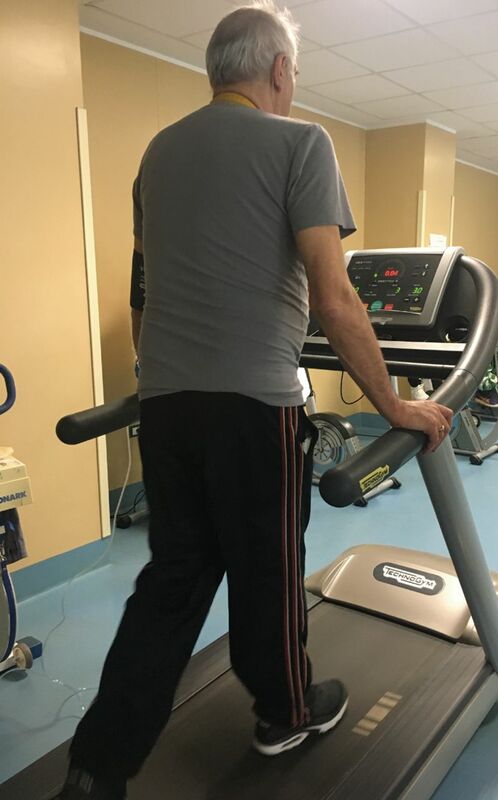 As a consequence guidelines for management of COPD suggest that exercise training should be provided to the vast majority of patients [19, 50]. The structure of an exercise programme is described in reference . Figure 1 shows an inpatient exercise training programme. An inpatient exercise training programme in progress. Different patterns of change in activity levels following pulmonary rehabilitation can be found in patients with COPD. Focusing on light physical activity might be a potential strategy to make patients less sedentary . Benefits of a low-intensity intervention may be limited to patients with moderate airway obstruction . Physical activity can enhance the benefits of smoking cessation. Former smokers that are physically active may show improved HRQoL that tends towards that of nonsmokers . In many countries, there are barriers to hospital-based supervised exercise training programmes, such as a high number of patients, transportation, programme costs and geographical obstacles . Home programmes may be a useful and equivalent alternative to outpatient hospital-based programmes . Tele-rehabilitation may also be potentially useful to deliver and maintain the benefits of pulmonary rehabilitation in difficult-to-reach areas . Monitoring daily step count and activity time is the most valid measurement of physical activity, and may benefit patients in achieving an effective daily physical activity . Pedometers have advanced greatly in recent years, providing daily step estimates, and smartphones with miniaturised accelerometre apps are technologies which many patients may not use as they probably should [60, 61]. However, some caution must be devoted when suggesting physical activity in older persons with mobility limitations in whom excessive physical activity may be associated with higher respiratory hospitalisation rates than health education . Food intake is a modifiable factor for development and progression of COPD and other CRD. A healthy diet can help to maintain good health . Emerging evidence indicates that nutrition can influence development and progression of obstructive respiratory diseases such as COPD and asthma . In a population study, below the range of 22.5–25 kg⋅m−2 BMI correlated inversely with overall mortality, mainly because of strong inverse correlation with respiratory diseases and cancer [38, 65]. There is evidence that unintended weight loss is an independent determinant of survival, suggesting the need for weight maintenance in patient care. The important role of muscle wasting and decreased muscle oxidative metabolism in impaired physical performance and mortality of patients with COPD has been demonstrated, providing new evidence for nutritional supplementation as an adjunct to exercise training, not only in advanced disease but also in the earlier stages of disease. In addition, the central role of osteoporosis, visceral adiposity and poor dietary quality in COPD risk and progression makes dietary awareness and intervention an integral part of disease management, from prevention to chronic respiratory failure . Nutritional supplementation promotes weight gain and increases muscle mass among patients with COPD, especially if they are undernourished and when combined with exercise training [66, 67]. However, the potential of nutritional supplementation to enhance efficacy of exercise training is not well established. Limited studies are available that differ in COPD target population and nutrient composition, and most of them are underpowered . The quality of food also matters. The Mediterranean diet has protective effects for allergic respiratory diseases and is associated with asthma control, while consumption of pro-inflammatory foods may contribute to worsening the diseases and Western diet may be associated with an increase in asthma exacerbations . High consumption of fruits and vegetables is associated with reduced COPD incidence in both current and ex-smokers, but not in never-smokers . Better diet quality is associated with improved asthma symptoms over time in never-smokers, independent of BMI . Current evidence suggests a positive impact of agriculture-based food security programmes on dietary indicators in low and lower-middle income countries . Patients' adaptation to their diseases is an important factor in comprehensive management of COPD . In order to maintain patients' well-being, promote self-efficacy and improve patients' health outcomes, programmes of collaborative self-management have been designed. These programmes increase patients' knowledge about their disease, the use of drugs and devices, the management of symptoms and exacerbations, and physical activity, and enhance their skills to cooperate in disease management . A meta-analysis showed that self-management programmes can provide a significant benefit to COPD patients in terms of HRQoL, exercise capacity and some aspects of their self-efficacy . Adherence to a written action plan can reduce exacerbation recovery time by enabling prompt awareness of symptom worsening and access to drugs . Research has identified many ways to reduce or prevent the burden of COPD and other CRD; however, there is still a huge gap between scientific knowledge and population-based interventions. Research to address and implement the required interventions involves biomedical advances as well as social, psychological, economic, and policy research. We still need to elaborate more effective evidence-based policies and interventions to control tobacco use, address environmental pollution and occupational exposures, improve the prevention and treatment of respiratory infections, and promote physical activity and better nutrition worldwide. The first step to properly manage any disease is to make an early and appropriate diagnosis. The cornerstone of early diagnosis and monitoring of COPD is to assess lung function. Smoking cessation and reduction of environmental exposures is key. Population-level interventions aimed at early diagnosis, promotion of vaccinations, and reducing smoking, physical inactivity, obesity and malnutrition may increase life-years lived in good health. Pharmacotherapy and nicotine replacement reliably increase long-term smoking abstinence rates. The effectiveness and safety of e-cigarettes is uncertain at present. To date, there is no evidence for preferring any form of behavioural or pharmacological treatment for smoking cessation. Influenza and pneumococcal vaccination may decrease the incidence of respiratory complications and respiratory tract infections. Antibiotic therapy has a role in prevention of COPD exacerbations. Promotion of physical activity is crucial, as is provision of appropriate dietary advice. Education and self-management are useful. Regarding the effectiveness of the influenza vaccination, which of the following is/are correct? Which of the following is/are the most effective intervention(s) to quit smoking? Which of the following is/are an effective strategy to increase physical activity?
. International Approach to Environmental and Lung Health. A Perspective from the Fogarty International Center. Ann Am Thorac Soc 2018; 15: Suppl. 2, S109–S113. European summit on the prevention and self-management of chronic respiratory diseases: report of the European Union Parliament Summit (29 March 2017). Clin Transl Allergy 2017; 7: 49. Smoking, physical inactivity and obesity as predictors of healthy and disease-free life expectancy between ages 50 and 75: a multicohort study. Int J Epidemiol 2016; 45: 1260–1270.
. Physician screening for multiple behavioral health risk factors. Am J Prev Med 2004; 27: Suppl., 34–41.
. Time trends in leisure time physical activity, smoking, alcohol consumption and body mass index in Danish adults with and without COPD. BMC Pulm Med 2016; 16: 110. Physical activity, sedentary habits, sleep, and obesity are associated with asthma, allergic rhinitis, and atopic dermatitis in Korean adolescents. Yonsei Med J 2017; 58: 1040–1046.
. Intervention mapping: a process for developing theory- and evidence-based health education programs. Health Educ Behav 1998; 25: 545–563.
. Screening for COPD: the gap between logic and evidence. Eur Respir Rev 2017; 26: 160113.
. Vaccination of adults with asthma and COPD. Allergy 2011; 66: 25–31. Influenza vaccine effectiveness to prevent influenza-related hospitalizations and serious outcomes in Canadian adults over the 2011/12 through 2013/14 influenza seasons: a pooled analysis from the Canadian Immunization Research Network (CIRN) Serious Outcomes Surveillance (SOS Network). Vaccine 2018; 36: 2166–2175. Influenza vaccine for patients with chronic obstructive pulmonary disease. Cochrane Database Syst Rev 2006; 1: CD002733. Injectable vaccines for preventing pneumococcal infection in patients with chronic obstructive pulmonary disease. Cochrane Database Syst Rev 2010; 11: CD001390.
. Immunization update: the latest ACIP recommendations. J Fam Pract 2014; 63: 137–140. Pneumococcal vaccination strategies in adult population: perspectives with the pneumococcal 13-valent polysaccharide conjugate vaccine. Minerva Med 2014; 105: 89–97. Global Initiative for Chronic Obstructive Lung Disease. Global strategy for the diagnosis, management and prevention of chronic obstructive pulmonary disease (2018 report). http://goldcopd.org/gold-reports Date last accessed: April 26, 2018.
. Chronic respiratory infection in patients with chronic obstructive pulmonary disease: what is the role of antibiotics? Int J Mol Sci 2017; 18: E1344. Smoking decreases the duration of life lived with and without cardiovascular disease: a life course analysis of the Framingham Heart Study. Eur Heart J 2004; 25: 409–415. GBD 2015 Chronic Respiratory Disease Collaborators. Global, regional, and national deaths, prevalence, disability-adjusted life years, and years lived with disability for chronic obstructive pulmonary disease and asthma, 1990-2015: a systematic analysis for the Global Burden of Disease Study 2015. Lancet Respir Med 2017; 5: 691–706. Impact of chronic obstructive pulmonary disease (COPD) in the Asia-Pacific region: the EPIC Asia population-based survey. Asia Pacific Fam Med 2015; 14: 4.
. Smoking and death: the past 40 years and the next 40. BMJ 1994; 309: 937–939. Smoking cessation for people with chronic obstructive pulmonary disease. Cochrane Database Syst Rev 2016; 8: CD010744. Effect of a smoking ban on respiratory health in nonsmoking hospitality worker: a prospective cohort study. J Occup Environ Med 2014; 56: e86–e91. Legislative smoking bans for reducing harms from second hand smoke exposure, smoking prevalence and tobacco consumption. Cochrane Database Syst Rev 2016; 2: CD005992. Pharmacological interventions for smoking cessation: an overview and network meta-analysis. Cochrane Database Syst Rev 2013; 5: CD009329.
. A systematic review of possible serious adverse health effects of nicotine replacement therapy. Arch Toxicol 2017; 91: 1565–1594. Electronic cigarettes. A position statement of the forum of international respiratory societies. Am J Respir Crit Care Med 2014; 190: 611–618. Clinical Practice Guideline Treating Tobacco Use and Dependence 2008 Update Panel, Liaisons, and Staff. A clinical practice guideline for treating tobacco use and dependence: 2008 update: A U.S. Public Health Service Report. Am J Prev Med 2008; 35: 158–176. World Health Organization. Air pollution. www.who.int/airpollution/en/ Date last accessed: May 2, 2018. Population-wide preventive interventions for reducing the burden of chronic respiratory disease. Int J Tuberc Lung Dis 2015; 19: 1007–1018.
. Household air pollution and its effects on health. F1000Res 2016; 5: 2593. Occupational lung diseases: from old and novel exposures to effective preventive strategies. Lancet Respir Med 2017; 5: 445–455.
. Prevalence and risk factors of chronic obstructive pulmonary disease in China (the China Pulmonary Health [CPH] study): a national cross-sectional study. Lancet 2018; 391: 1706–1717. Too much sitting: the population health science of sedentary behavior. Exerc Sport Sci Rev 2010; 38: 105–113. Impact of physical inactivity on the world's major non-communicable diseases. Lancet 2012; 380: 219–229. Physical activity level as a predictor of healthy and chronic disease-free life expectancy between ages 50 and 75. Age Ageing 2018; 47: 423–429. The effect of physical activity on mortality and cardiovascular disease in 130000 people from 17 high-income, middle-income, and low-income countries: the PURE study. Lancet 2017; 390: 2643–2654. Associations of total and type-specific physical activity with mortality in chronic obstructive pulmonary disease: a population-based cohort study. BMC Public Health 2018; 18: 268. Large-scale physical activity data reveal worldwide activity inequality. Nature 2017; 547: 336–339. Disease progression and changes in physical activity in patients with chronic obstructive pulmonary disease. Am J Respir Crit Care Med 2015; 192: 295–306.
. Does physical fitness enhance lung function in children and young adults? Eur Respir J 2018; 51: 1701374. Regular physical activity reduces hospital admission and mortality in chronic obstructive pulmonary disease: a population-based cohort study. Thorax 2006; 61: 772–778. Regular physical activity modifies smoking-related lung function decline and reduces risk of chronic obstructive pulmonary disease. A population-based cohort study. Am J Respir Crit Care Med 2007; 175: 458–463.
. Activity levels and exercise motivation in patients with COPD and their resident loved ones. Chest 2017; 151: 1028–1038. Aerobic exercise training in very severe chronic obstructive pulmonary disease: a systematic review and meta-analysis. Am J Phys Med Rehabil 2017; 96: 541–548. Does exercise training change physical activity in people with COPD? A systematic review and meta-analysis. Chron Respir Dis 2012; 9: 17–26. Changes in physical activity and sedentary behaviour following pulmonary rehabilitation in patients with COPD. Respir Med 2017; 126: 122–129. A lifestyle physical activity intervention for patients with chronic obstructive pulmonary disease. A randomized controlled trial. Ann Am Thorac Soc 2016; 13: 617–626.
. The role of physical activity in the association between smoking status and quality of life. Nicotine Tob Res 2018; in press [https://doi.org/10.1093/ntr/nty052].
. The role of tele-medicine in patients with respiratory diseases. Expert Rev Respir Med 2017; 11: 893–900. Rima Setijadi A, et al. Benefits and costs of home pedometer assisted physical activity in patients with COPD. A preliminary randomized controlled trial. Pulmonol 2018; 24: 211–218. Verification of a motion sensor for evaluating physical activity in COPD patients. Can Respir J 2018; 8343705.
. Effect of structured physical activity on respiratory outcomes in sedentary elderly adults with mobility limitations. J Am Geriatr Soc 2016; 64: 501–509.
. Nutrition and respiratory health – feature review. Nutrients 2015; 7: 1618–1643. The relationship of dietary patterns with adult lung function and COPD. Eur Respir J 2010; 36: 277–284. Body-mass index and cause-specific mortality in 900000 adults: collaborative analyses of 57 prospective studies. Lancet 2009; 373: 1083–1096. Nutritional assessment and therapy in COPD: a European Respiratory Society statement. Eur Respir J 2014; 44: 1504–1520.
. Nutrition in pulmonary rehabilitation. In: Clini E, Holland AE, Pitta F, et al., eds. Textbook of Pulmonary Rehabilitation. Cham, Springer International, 2018; pp. 145–153.
. Nutritional targets to enhance exercise performance in chronic obstructive pulmonary disease. Curr Opin Clin Nutr Metab Care 2012; 15: 553–560. Diet and asthma: is it time to adapt our message? Nutrients 2017; 9: 1227. Fruit and vegetable consumption and risk of COPD: a prospective cohort study of men. Thorax 2017; 72: 500–509. Longitudinal study of diet quality and change in asthma symptoms in adults, according to smoking status. Br J Nutr 2017; 117: 562–571. The impact of poverty reduction and development interventions on non-communicable diseases and their behavioural risk factors in low and lower-middle income countries: a systematic review. PLoS One 2018; 13: e0193378. Self-management programmes for COPD: moving forward. Chron Respir Dis 2012; 9: 27–35. The effects of chronic obstructive pulmonary disease self-management interventions on improvement of quality of life in COPD patients: a meta-analysis. Respir Med 2016; 121: 81–90. Effects of written action plan adherence on COPD exacerbation recovery. Thorax 2011; 66: 26–31.